Sugarbloom Cupcakes - Perth WA: Sugarbloom featured on Cake Wrecks - Sunday Sweets. Sugarbloom featured on Cake Wrecks - Sunday Sweets. If you're gonna get featured on Cake Wrecks, Sunday Sweets is the better segment to be in!! If you've not yet been inititated into the realm of Cake Wrecks, pop round to your neighbours and tell them to ignore the maniacle laughter eminating from your house, grab a box of kleenex for your tears of hilarity and 'zomg' at the awesome pics and brilliant narration. A cult classic in the making. 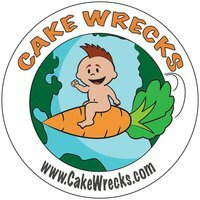 Click on the Cake Wrecks Logo to visit!